The prophetical books of the old Testament are commonly divided into the five Major Prophets and the twelve Minor Prophets. 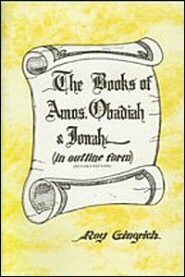 Amos, Jonah, and Obadiah, the Bible books commented upon in this book, are listed among the Minor Prophets. But let us not misunderstand “minor.” The word has no reference to inspiration, importance, or value, but rather, to the length of the books. Many of the Minor Prophets record major messages. Contrary to general opinion, these books treat live, modern-day issues, such as social and religious evils in Amos, the judgments of God in Obadiah, and racial prejudice in Jonah. The studies discuss first the author, the setting, and the purpose of each book. This is followed by an analytical outline which approaches a brief commentary.